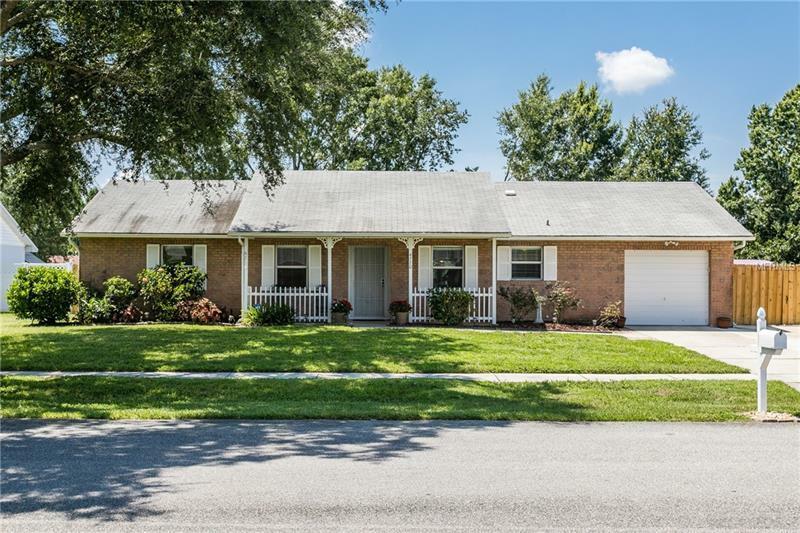 Fully updated MOVE IN READY single family, single story home in desirable Ethans Glen neighborhood for sale. Current owner of 29 years has kept immaculate care of this three bedroom PLUS DEN, three bedroom home. As you walk in you'll immediately notice how the beautiful ceramic wood tile flooring runs throughout the entire home and how the vaulted ceilings create a grand yet welcoming space between the dining space, living room and kitchen. Fall in love with the granite countertops and backsplash and high end cabinets in the kitchen. The entrance to the attached, oversized single car garage is off the kitchen. French doors in the spacious living room lead out to the enclosed Florida room which is perfect for an office, library or playroom. This room is divided into two rooms and also leads out to the backyard. French doors off the master suite lead to the second section of the Florida room. Master bath has been updated and has a shower/bath combination and single vanity. The second and third bedrooms are across the hall from the master, both with generous sized closets. The hall bath has been updated as well. The den has a door for privacy off the living room. This backyard is where you'll love to spend your time relaxing or entertaining your guests. Fully fenced-in, TWO sheds, a deck with gazebo, and uncovered pavered space with fireplace; it has everything you could need! PLUS space to park your boat or toys. Zoned schools include Shenandoah, Conway MS and Boone! The best of Conway with no HOA fees!